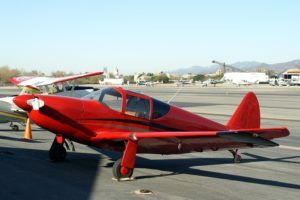 The Globe Aircraft Corporation was originally formed as the Bennett Aircraft Corporation with the intention of manufacturing airplanes from Duraloid, a phenol-formaldehyde Bakelite-bonded plywood. In 1941 the company was reorganized and the name was changed to Globe Aircraft Corporation. The first product of the re-constituted company was a small two-seat low-wing cabin monoplane known as the Swift. The Swift model GC-1 never went into production because of the restriction on the materials that were used. In 1946 a new version of the Swift was produced and two models were in production: the GC-1 with an 85 HP Continental four-cylinder horizontally opposed engine and the GC-1B with a 125 HP Continental six-cylinder engine. The GC-1A made its initial test flights in January 1945. Later that year, the Swift received a more powerful engine of 125 HP, making it the Globe GC-1B Swift. Because of the huge success of the airplane a tremendous demand and backlog of orders for Swifts resulted. To meet this backlog of orders, Globe entered into a contract with TEMCO (Texas Engineering and Manufacturing Company) at nearby Grand Prairie, Texas, to build Swifts under sub-contract simultaneously with the Globe production. TEMCO began producing GC-1B Swifts at the rate of 15 per day. Globe and TEMCO together produced a total of 833 GC-1B’s in just over a six month period. This production rate caught up with orders and it was not long before parking lots at both Globe and TEMCO were full of unsold Swifts. Globe soon closed its doors for various business reasons but primarily to avoid what we would today call a corporate “hostile takeover.” TEMCO being the largest debtor received permission from the “receiver” to obtain all of the rights to the airplane and went on to build 260 more aircraft before shutting Swift production down permanently in 1951.